On Friday December 9th, an email arrived in my inbox from author Alice Pung advising that the Australian Government is holding a Senate Inquiry into Freedom of Speech, and submissions were closing on the day! 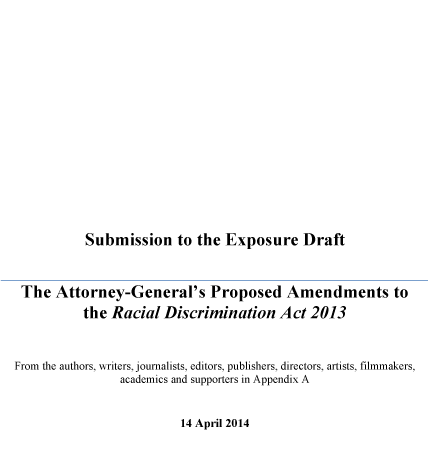 Pung was in contact as the Race Discrimination Commissioner Dr Tim Soutphommasane had advised that she could re-submit the 2014 document I had signed on behalf of Peril editors and board members, contributions from 175 Australian authors, writers, journalists, editors, publishers, directors, artists, filmmakers, academics and supporters who have made a submission to the Exposure Draft of The Attorney-General’s Proposed Amendments to the Racial Discrimination Act. We have never felt our freedom of speech threatened by the current Racial Discrimination Act 1975. We firmly oppose the proposed amendments to the Act. We submit that we will endeavour to do all we can in our respective fields to ensure that Australia does not become a country that condones ‘bigotry’ – unsubstantiated and untrue racist comments and discourse that incite hatred towards others. In 2014, under the guise of free speech, Attorney-General George Brandis defends the right to be bigots in Australia. In Brandis’ version of a free country, “people do have rights to say things that other people find offensive or insulting or bigoted”. In 2014, when the Government refused to make submissions publicly available, which is part of a normal consultation process, the Human Rights Law Centre invited the public to send their submissions to be made available on their website for public discourse. The key events that had led to this year’s inquiry’s focus on section 18C of the Racial Discrimination Act and the complaints process of the Australian Human Rights Commission was Bill Leak’s controversial cartoon and the dismissal of the QUT discrimination case. For a detailed analysis and overview about the events that have led to the Parliamentary Inquiry, see NITV (National Indigenous Television) Explainer: The Freedom of Speech Inquiry. We’re also alarmed that the Australian Human Rights Commission’s president Professor Gillian Triggs is of the view that removing offend and insult and inserting “vilify” would be a strengthening of the laws. The closing date for submissions was set as Friday, 9 December 2016; however, the committee has agreed to accept submissions until 23 December 2016 if an extension is required. The Castan Centre for Human Rights’s list of publicly available submissions: Freeing the RDA ‘Free Speech’ submissions.